Is it really that important to have a lot of friends? I think that I can feel just as lonely even when I have a lot of friends. I am the one that tends to not call or not let people get too close to me. I think it’s the little girl in me that doesn’t want to be hurt over and over again. So I just keep a handful of friends, and I tell each of them just how much I want them to know about me. When I thought that I had a good friendship starting, all the other person wanted to do was talk about her life, her day and her everything. I understand that she obviously needs to talk, but when she is done she immediately says ok, well I have to go. What’s up with that???? 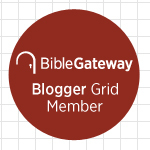 Your blogs make me think and also think deeper about Jesus. Thank you. No, I don’t think it’s important to have lots of friends as long as you have a couple of great friends you can really count on and confide in. Even before the fall, when everything was right with the world, God said, “It is not good that man should be alone.” We do need other people. But after sin entered the world, friendships got harder and messier. I had a wonderful professor who taught, “People get hurt in relationships, and they get healed in relationships” – but once you’ve been hurt, it’s harder to risk making friends. The kind of one-sided relationship you are talking about is not mutual, and so I would not call it a real friendship. A friendship can be one-sided for a season, during a time of extraordinary need, but to be a real friendship there should be give-and-take over time, risk-taking on both sides, room for mistakes, space for confession, true forgiveness, love and laughter. When only one person is sharing, giving, taking, etc., you are talking about a role you have in their life, not a relationship. It might be appropriate in some cases for you to have a role like that – with an elderly relative, for example. But if you are feeling used, as though you are simply a warm body on the other end of the phone, I think you are free to step back from that relationship and look for one that feels more like a friendship. You are not being fed and refreshed, and the sad part is that you are becoming resentful. I know it will take courage for you to reach out and try again. I pray that God will give you that strength. You’ve already been hurt in relationship – may you now find some healing in a true friendship. Can You Love a Narcissist? I’ve read a few blogs and been told by a counselor to cut off the narcissist in my life because it’s too difficult to maintain a relationship with someone who thinks about themself all the time. I admit I’ve been hurt in the past, but I’m not sure I’m ready to take such a big step. What do you think about black-and-white advice like this? I’d need a lot more information to give you my best advice, but, in general, I think it’s unwise to make black-and-white rules about a whole category of people based on a subjective diagnosis. It would be rather like saying you should never pet large dogs. While that decision might keep you safe, it would also limit your life in a way which might not be necessary and might not be God’s best for you. We all start life as narcissists. We all come into this world seeing ourselves as the center of it, possessing little or no empathy for others, manipulating those around us and believing in our own hyperbolic specialness. Most of us are able to grow past that stage, but for reasons no one understands, a few people never do. Yet even for adults diagnosed with narcissistic personality disorder, there is a continuum; all personality disorders are variable and subjective in their diagnosis, presentation and degree. Most narcissists are not serial killers, though an extreme few are. Some are quite good at their jobs. Some maintain marriages and families and friendships. A few even manage to improve over time. For the reasons stated above, I don’t think you can lump all narcissists and their loved-ones together and make blanket statements about how to deal with them. Are we talking about a lover, an employer, a sibling, a friend? We have more responsibility toward some than others. And what of the person asking the question – what are they strong enough to do? What are they being called to do? You might need to separate from a narcissist, either temporarily or permanently, because your heart has been so damaged that you can no longer relate to that person at all, in any helpful way. But that is not always how Jesus dealt with difficult, unsafe people (Judas and even Peter, for example). In many cases there is probably some middle ground between being consumed and ending all contact. The mistake generally comes in believing that love means allowing yourself to be consumed. I am not sure we can say God has the exact same ‘no-contact’ plan for every person who is afraid of large dogs – nor for everyone who knows a narcissist. I’m looking for the most thorough, rigorous Christian premarital counseling book that you’re aware of. I need recommendations for a Christian couple that’s recklessly rushing towards marriage after spending very little time together. They’re determined to hold their wedding asap, but they’re also very open to premarital counseling and any books we recommend to them. I’m looking for a book that challenges naivete and the fairy tale they’ve spun for themselves about the necessity to get married now, without experiencing each other over time. Many thanks! This couple is blessed to have such a caring friend, and they may need your friendship more in the months to come if they are rushing into marriage. Before I address your question, I’d like to address your underlying fear. While there is some evidence to indicate that a longer dating relationship gives marriage a better chance of success, it is far from the only factor. The Bible does not presume that a bride and groom even KNOW one another before they marry. It gives them the same advice as it gives couples in longer dating relationships: to love and respect one another (Col. 3:18-19), not to divorce (Matt. 19:1-6) and to work as a team to build God’s Kingdom (Ps. 45). If both spouses love Jesus and are even more committed to Him than they are to each other, that will give them the strength, wisdom and grace they need to create a loving partnership. Other factors, such as their cultural value systems, family support, income and communication styles are also very important, and those are things that should come out in premarital counseling. But be warned: I have tried to talk people into postponing marriage with very little success. Those in love are thinking not primarily with their heads, but with their hearts filtered through Cupid’s chemicals. Give them all your best advice, but in the end, YOU must trust God for His work in their lives – through a happy marriage or an unhappy one. While I know of no resource which deliberately bursts young love’s balloon, there are some books below that I would recommend, in no particular order. I would also recommend that the couple talk with a pastor or counselor who is trained in premarital work, someone who can speak into their lives with compassion and wisdom. May God guide them – and you, too, as you walk alongside them. Preparing for Marriage by Boehi, et al.